So many possibilities. But this prompt plays so directly into something I’ve been working on for quite some time, I’m taking advantage. A couple weeks ago, my husband helped me move just about every item in my office. We relocated the desk, the shelving and all its contents, the reading chair, all the artwork. Everything. The result improved my view, put essentials at easier reach, and made me even more excited to enter the room. My office walls are a vibrant orange—”nasturtium”—a cheerful, energizing color that invites creativity and action. But until now the furniture arrangement did not match. Knowing this, I drew up a revised floor plan back in August. Three months later, I finally found the time and motivation to change it. And now that we’ve taken those first, hard steps, I’m eager to do more. That’s why, for today’s make something action, I made a purchase. 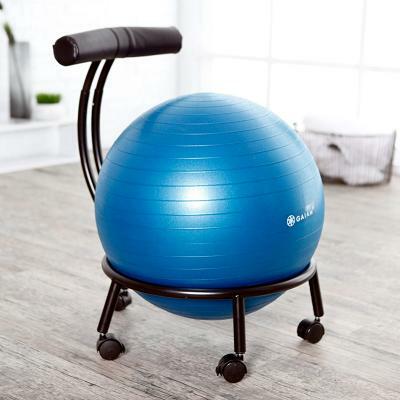 I ordered a Custom Fit Balance Ball Chair from GAIAM. I even bought a beautiful green cover for the balance ball, to add a pop of contrast against the orange walls. I can hardly wait for the package to arrive. So I await the GAIAM delivery, ready and willing to sit and work in a new way. If you’re already balancing your way through your days, let me know how it’s going for you.